King of Castile; born at Seville in 1333; died in 1379; illegitimate brother of Pedro I. He was as hostile to the Jews as Pedro had been friendly. 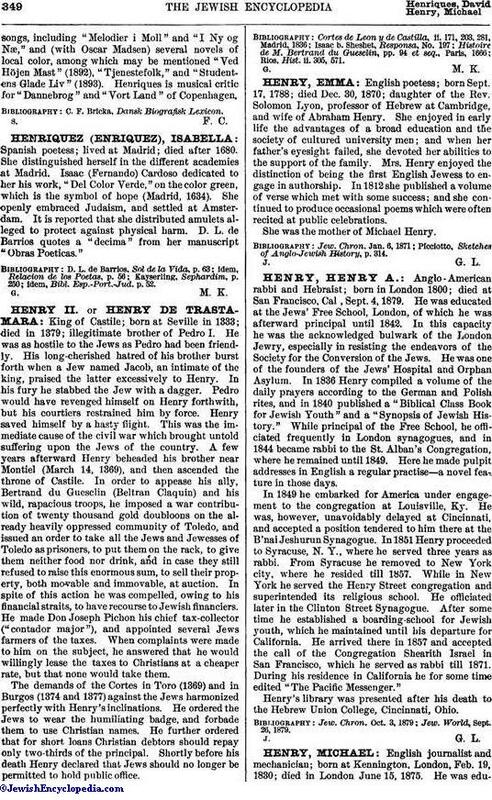 His long-cherished hatred of his brother burst forth when a Jew named Jacob, an intimate of the king, praised the latter excessively to Henry. In his fury he stabbed the Jew with a dagger. Pedro would have revenged himself on Henry forthwith, but his courtiers restrained him by force. Henry saved himself by a hasty flight. This was the immediate cause of the civil war which brought untold suffering upon the Jews of the country. A few years afterward Henry beheaded his brother near Montiel (March 14, 1369), and then ascended the throne of Castile. In order to appease his ally, Bertrand du Guesclin (Beltran Claquin) and his wild, rapacious troops, he imposed a war contribution of twenty thousand gold doubloons on the already heavily oppressed community of Toledo, and issued an order to take all the Jews and Jewesses of Toledo as prisoners, to put them on the rack, to give them neither food nor drink, and in case they still refused to raise this enormous sum, to sell their property, both movable and immovable, at auction. In spite of this action he was compelled, owing to his financial straits, to have recourse to Jewish financiers. He made Don Joseph Pichon his chief tax-collector ("contador major"), and appointed several Jews farmers of the taxes. When complaints were made to him on the subject, he answered that he would willingly lease the taxes to Christians at a cheaper rate, but that none would take them. The demands of the Cortes in Toro (1369) and in Burgos (1374 and 1377) against the Jews harmonized perfectly with Henry's inclinations. He ordered the Jews to wear the humiliating badge, and forbade them to use Christian names. He further ordered that for short loans Christian debtors should repay only two-thirds of the principal. Shortly before his death Henry declared that Jews should no longer be permitted to hold public office. Rios, Hist. ii. 305, 571.